Katie has over a decade of experience in the energy industry, with responsibilities across corporate affairs, communications strategy, brand development, and policy. As Director of Market Development, McClain helps deliver the Fund's strategic value to key stakeholders: limited partners and entrepreneurs. She is responsible for developing business leads for the Fund's portfolio companies, helping portfolio and pipeline companies navigate and leverage the network, and leading the marketing and communication efforts of the Fund. 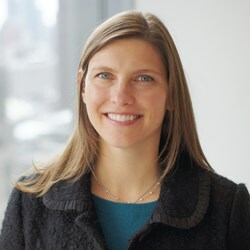 A clean energy leader with valuable industry experience and connections, McClain was previously Vice President of Public Affairs for Invenergy - North America's largest independent renewable energy generation company. She holds a Master's degree in Public Policy from the University of Chicago and a BA from DePauw​ University.